sterling silver, 24k gold; 3 1/4" x 5/8" x 1/2"
Tikkun Olam translates to "repair the world". 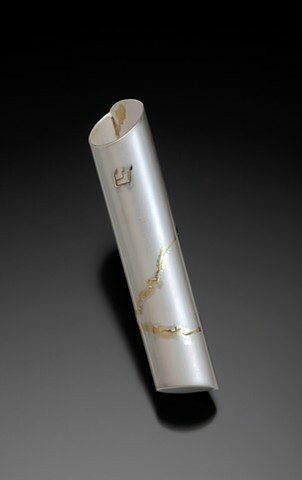 This mezuzah is a meditation on the Japanese concept of "kintsugi" - the philosophy that the repair is something to be celebrated, that what is broken and repaired is more beautiful for having its history. This mezuzah won the 2015 NICHE Award in the Professional category of Judaica.